It was once said that all a film needs for drama is two people having a conversation. Writer/director J.C. Chandor (Margin Call) seeks to prove that one of those people is redundant in his second feature, All is Lost, the tale of an ageing man alone at sea. Our man is on a solo voyage in the Indian Ocean when his yacht collides with a shipping container that has fallen off a cargo ship. With his communications and navigational equipment ruined and his vessel taking on water, the resourceful man finds himself fighting to survive and at the mercy of the ocean. All is Lost is a minimalist film. There is no fat on it. The film starts at the moment that the Virginia Jean starts to take on water and it finishes at the moment that we discover his final fate. It is a film unburdened by context and backstory. We know very little about this character outside of his immediate circumstances. We don’t know why he is out there. We don’t know if he has a family or not. We don’t know if he is a good person or a bad person. We don’t even know his name. All we know is that he is a human being and he is fighting for his life. And you know what? That is enough. That is all we actually require to care about this man and become invested in his situation. In a time where every reality television contestant comes complete with a tragic backstory of a hurdle they’ve overcome, a relative with terminal illness or a child they’re hoping to inspire, all designed to manipulate the emotions of an audience and cynically tug at their heart strings, it is refreshing to see the way that Chandor trusts his audience. He trusts his audience to care without needing to over-emotionalise the situation. As the film’s lone character – credited simply as ‘Our Man’ – Robert Redford is compelling to watch. With no other characters to talk to, he hardly speaks a word in the film. Chandor’s faith in the audience to work things out for themselves means he doesn’t resort to having the character talk to himself. Nor does he include a narration to explain what he is thinking and feeling. Instead it is up to Redford’s face and his actions to do the talking. Where a more insecure actor may have given into the temptation to overact, Redford maintains an incredible subtlety. Our man is stoic and unemotive, which makes those moments when his resolve does break all the more powerful. But despite this stoicism we can always see that his mind is working, that he has a plan. It is a masterful performance from a Hollywood legend which should see him in the mix come award season. 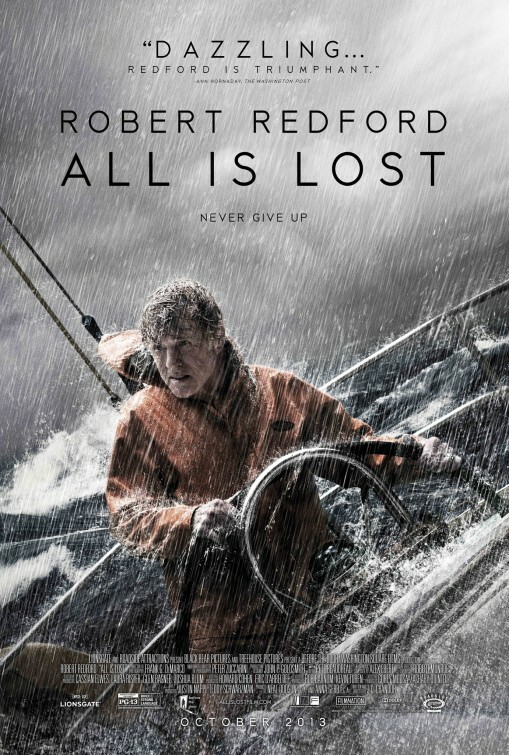 All is Lost screened out of competition at the Cannes Film Festival this year, with Redford receiving a standing ovation for his performance. It is the type of film that is more likely to make its presence felt at film festivals than at the box office. The nature of Chandor’s film means that it is a less commercially attractive prospect than last year’s lost at sea film – the equally brilliant Life of Pi – but it is a powerful piece of filmmaking which really sticks in your mind.